Hilary was born in Londonderry, Northern Ireland and was brought up in the Stormont district of Belfast. Her father was a senior public servant with a formidable intellect. From 1948 he had a major role in establishing the NHS in N. Ireland. This important point in the social history of the Province played a significant part in family life during her childhood and led to her lifelong interest in social issues. Her mother’s family came from the shores of Loch Esk in Co Donegal and had links with the Rev Robert Walker who was instrumental in closing the gates of the city of Londonderry when that city was besieged by James I! She was educated at Strathearn School for girls in Belfast and at Trinity College, Dublin where she graduated in English and Social Studies, completing a thesis which reviewed the care of the elderly. She followed a post graduate training course at the Institute of Medical Social Work in London. Whilst a student she worked as a volunteer in Bethnal Green living at Oxford House University Settlement at a time when there was much interest in the family structures and social networks in that area. Oxford House was founded by Keble College, Oxford in 1884 to enable graduates and students to live and work alongside residents in one of the most deprived areas in the country. Whilst there she met her future husband (Geoffrey Lewis, Lit and Phil President in 1988/9) and they were married in the British Empire Chapel at St. Paul’s Cathedral. In 1981 she was appointed as a magistrate on the Leicester Bench which is one of the largest in England. Since then she has been a member of the Family Panel, the Youth Panel and served on many bench committees. She has held several positions of responsibility on the Bench and was elected Chairman of the Leicester Bench from 2003 to 2006 being only the second woman to hold that position. Since 2006 she has been actively associated with the Government’s community justice initiative for which Leicester was a pilot area. The broad aim has been to increase public confidence in the judicial system. Engagement with local communities is seen as an important aspect of the initiative. She joined the Leicester Literary and Philosophical Society in 1975 and has been its Programme Secretary since 1989 (jointly with her husband). 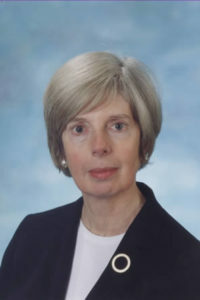 She was President of the Society in 2001 and negotiated the transfer of the Peach Fund from Leicester University to the Society enabling the Lit and Phil (in association with the University of Leicester) to undertake the organisation of the biennial Peach Lecture. She was honoured by the Society which made her Life Vice President for her contribution over the years. She is married to Dr Geoffrey Lewis and has a daughter who is psychiatrist and a son who is an architect. Presidential Address. If Stones could only Speake…Transactions of the Leicester Literary and Philosophical Society Vol. 95, 2001, pp. 2 – 6.